Convertible High-Pressure Water Jetting Systems. NLB’s newest family of hazardous area water jetting units are built around our innovative line of convertible pumps. These pumps have fewer parts for increased operating efficiency and simpler maintenance. And, they require only a simple conversion kit to operate at pressures between 8,000 and 40,000 psi (552 and 2,800 bar). These hazardous area units include features like automatic shut-down in the event of high engine water temperature, low engine oil pressure, high engine oil temperature, high hydraulic pump temperature, high coolant temperature, and high exhaust gas temperatures. The system also features an air starter motor, exhaust spark arrestor, and an air inlet shut down valve. 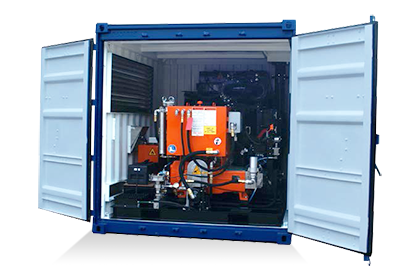 They can be built with either ATEX or IECEx engines and are rated for Zone 2 explosion proof conversion, category 3G, gas group IIA and B, and temperature class T3. The integrated control panel allows the operator to monitor the system while in operation. Forged steel crankshaft mounted in heavy duty bearings. Drive pinion output shafts on both sides of pump allow for opposite-hand drive. Whether you’re operating in the North Sea or the Gulf of Mexico, NLB has experience in developing the exact unit for your geographical specifications. Contact us and we will help you design the perfect unit to meet your particular needs.